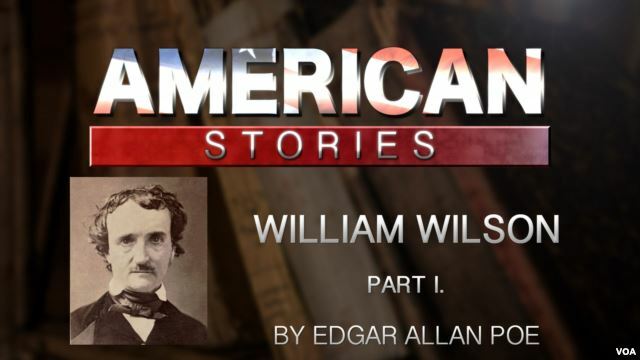 We present the first of four parts of the short story 'William Wilson,' by Edgar Allan Poe. The story was originally adapted and recorded by the U.S. Department of State. But the house! — what a delightful old building it was — to me truly a palace! There was really no end to it. I was not always able to say certainly which of its two floors I happened to be on. From each room to every other there were always three or four steps either up or down. Then the rooms branched into each other, and these branches were too many to count, and often turned and came back upon themselves! Our ideas about the whole great house were not very far different from the thoughts we had about time without end. During the five years I was there, I could never have told anyone how to find the little room where I and some eighteen or twenty other boys slept. The schoolroom was the largest room in the house — and I couldn't help thinking it was the largest in the world. It was long and low, with pointed windows and heavy wood overhead. In a far corner was the office of our head-teacher, Mr. Bransby. This office had a thick door, and we would rather have died than open it when he was not there. Inside the thick walls of this old school I passed my years from ten to fifteen. Yet I always found it interesting. A child's mind does not need the outside world. In the quiet school I found more bright pleasure than I found later, as a young man, in riches, or, as an older man, in wrongdoing. This troubled me greatly. I tried to make the others think that I didn't care. The truth was that I felt afraid of him. I had to fight to appear equal with him, but he easily kept himself equal with me. Yet no one else felt, as I did, that this proved him the better of the two.